ISS043E059259 (03/28/2015) — NASA astronaut Scott Kelly (left) is happy to be aboard the International Space Station after the hatch opening of the Soyuz spacecraft Mar. 28, 2015. Medical science and training took a significant portion of the Expedition 43 crew’s schedule Thursday. 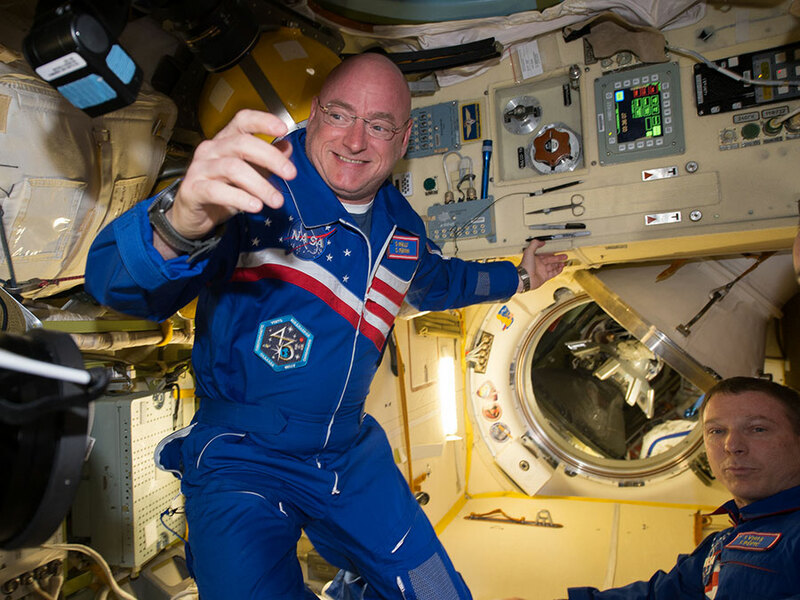 The newest three crew members are getting used to their new home on orbit. Finally, the International Space Station boosted its orbit. Several crew members participated in eye checks for the Ocular Health study as scientists study how microgravity affects vision during long duration missions. The newest trio to join Expedition 43 trained to prepare for a medical emergency while also familiarizing themselves with station systems. A docked ISS Progress 58 space freighter fired its engines boosting the space station’s orbit by eight-tenths of a mile. The reboost readies the station to receive the new ISS Progress 59 supply ship when it launches and docks April 28. Do crew members perform daily vision exercises,, maybe using virtual vision? I have to wonder if the dearth of medium-distant vistas to focus on might not also be a factor in vision changes.